UPDATED: Attorneys in the trial over ambulatory surgical center requirements for abortion facilities wrapped up their closing arguments Wednesday morning. U.S. District Judge Lee Yeakel said he would issue a ruling "as quickly" as possible, though an exact date wasn't given. Attorneys on both sides of the courtroom fight over an abortion regulation that could shut down most of the state's remaining clinics will present their closing arguments on Wednesday, wrapping up several days of trial before a federal judge who could hand down a decision in the next month. Attorneys for a coalition of Texas abortion providers have made their case against a new state law that will require abortion facilities to meet the same regulations as ambulatory surgical centers, or ASCs, starting Sept. 1. Since the trial began last week, they've argued that the rule presents an unconstitutional barrier for women seeking to obtain the legal procedure because so many clinics will be forced to close. They say an estimated 900,000 women in Texas would live farther than 150 miles from an abortion facility. Attorneys for the state have defended the new law, arguing that abortions are more dangerous than the providers admit and that the ASC requirements would improve patient care and the safety of the procedure. They argue that among Texas women of reproductive age, only 8.7 percent would live farther than 150 miles from an abortion provider. The lawsuit brought by the Center for Reproductive Rights was heard last week by U.S. District Judge Lee Yeakel, who presides over the U.S. District Court for the Western District of Texas. The ASC requirement is the last remaining provision to be implemented after the passage last year of House Bill 2; other elements took effect as early as October. When the ASC requirement goes into effect, only the six abortion facilities in Texas that currently meet the ASC requirements — all of them in major Texas cities — will remain open. Planned Parenthood is scheduled to open a new ASC in Dallas before September, and it is raising funds for another in San Antonio. But even with the new facilities, the provision would leave women living west or south of San Antonio anywhere from 150 t0 500 miles away from a Texas abortion facility. Last week, the providers' attorneys argued that the new restriction — which mandates that clinics have specific room and doorway sizes, along with locker rooms and infrastructure such as pipelines for general anesthesia — does nothing to improve the safety of abortion. They brought in several academics and medical experts who testified that Texas' mortality rate associated with childbirth is 100 times higher than the death rate associated with abortions. Jan Soifer, who is representing the abortion providers, argued that the construction requirements, which most providers have been unable to meet because of their high costs, would "expose women to greater health risks" by reducing the number and location of abortion clinics. She suggested it could even lead to an increase in self-induced abortions. State attorneys countered by bringing in several doctors to testify on the safety standards the new law would institute. Anderson described the new law as "protective of patients" and said there was a "necessity" to address "cracks in the health system" when it comes to complications related to abortions, which he believes are underreported. The providers' attorneys challenged the testimony of those doctors and several other witnesses brought forth by the state, questioning the involvement of Vincent Rue, an anti-abortion activist and psychotherapist from North Carolina who has been involved in other lawsuits over abortion restrictions. Attorneys for the abortion providers pointed to email exchanges between Rue and the state's witnesses in which he offered them suggestions as they drafted their expert reports and written testimony. The state's witnesses said they received some guidance from Rue, whom state attorneys described as a "consulting expert and agent of the state." But they said he did not play a major role in determining the basis of their arguments, although Anderson said Rue had served as a "wordsmith" who helped him pinpoint at least a third of the reports he cited in his testimony. The emails were entered into evidence over state attorneys' objections, and Yeakel said he would take the exchanges into consideration as he determined how much weight each report would have on his decision. At several points during the trial, state attorneys questioned several abortion providers who served as expert witnesses in the case about their intentions to open additional ASCs in other areas of the state, which would increase the number of providers available after September. Amy Hagstrom Miller, founder and CEO of the lead plaintiff, Whole Woman's Health, was questioned for more than two and a half hours on Tuesday. Hagstrom Miller testified that her team had made calls to facilities across the state to find an ASC that was within 30 miles of a hospital that had already credentialed one of their physicians. But she said those efforts proved futile. 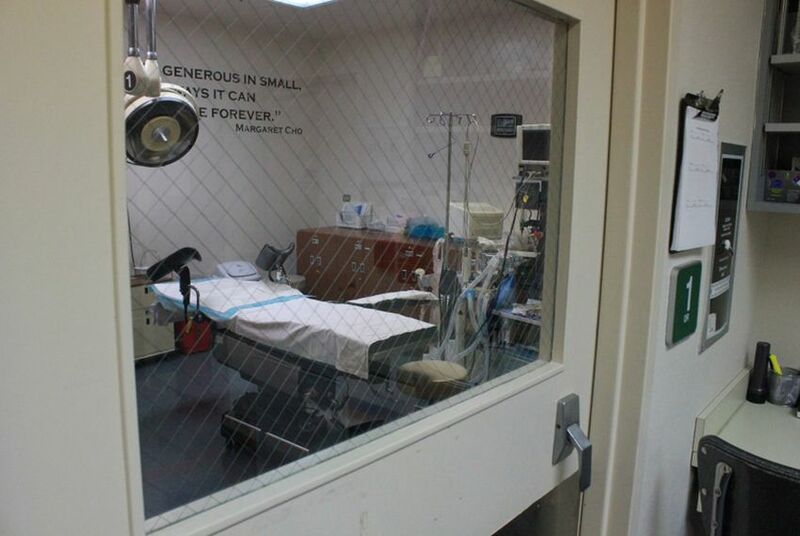 One available facility in Austin was ruled out when the building's deed prohibited abortions from being conducted on-site. She was unable to obtain another facility in Fort Worth after she could not find a bank to underwrite a loan for the company. She received rejection letters from at least 15 banks, she said, some of which rejected her by saying they did not want to partner with an abortion provider. Others were worried about the financial health of Whole Woman's Health, she said, after the closure of three of its five clinics. “They said there is no way we could repay a loan of that size,” Hagstrom Miller said. Last week, witnesses called by attorneys for the abortion providers testified that construction costs to retrofit existing abortion clinics in Texas could exceed $2 million. State attorneys challenged the figures, arguing that they were based on construction costs in other states. A health care consultant who was asked to serve as a witness for the state said those numbers had been inflated and estimated that costs could be less than $1 million. Abortion providers say regulations that have been implemented since HB 2 took effect have already caused about a dozen abortion clinics to close. There are currently 19 abortion clinics in Texas — down from 40 before the bill took effect. Most of those remaining clinics are expected to shutter when the ASC requirements provision goes into effect. The lawsuit is also seeking an exemption from the admitting privileges provision of the law for Reproductive Services in El Paso and Whole Woman's Health in McAllen, which both shuttered after their respective doctors were unable to obtain privileges at hospitals within 30 miles of the facilities. In March, a three-judge panel decided that abortion providers had not proved that the requirement for doctors to have admitting privileges at nearby hospitals would create an “undue burden." This time around, the providers' attorneys argued that low-income women would be disproportionately affected by the closures because they would be left hundreds of miles away from an abortion clinic. And they made their arguments with the backdrop of recent victories for abortion providers in other states. In late July, a panel of judges on the 5th U.S. Circuit Court of Appeals struck down a similar admitting-privileges requirement in Mississipi that would have closed the only remaining clinic in that state. As the Texas trial was starting up on Monday, a federal judge in Alabama struck down another similar admitting-privileges law. Attorneys for the state contend that the admitting-privileges provision will improve "continuity of care" for women who suffer complications from their procedures. They also argue that women in El Paso could make the short trip to New Mexico, where abortion is legal, to obtain the procedure, and that women in the Rio Grande Valley were within reasonable driving distance to San Antonio. On Thursday, Yeakel told both parties that he wanted to close the trial with a developed case and that he expected their closing arguments to include refined conclusions instead of "emotional" pleas. Yeakel's decision, which could come before the ASC requirements go into effect in September, will likely be appealed. Gilad Edelman contributed reporting to this story. Disclosure: Planned Parenthood was a corporate sponsor of The Texas Tribune in 2011. A complete list of Texas Tribune donors and sponsors can be viewed here.